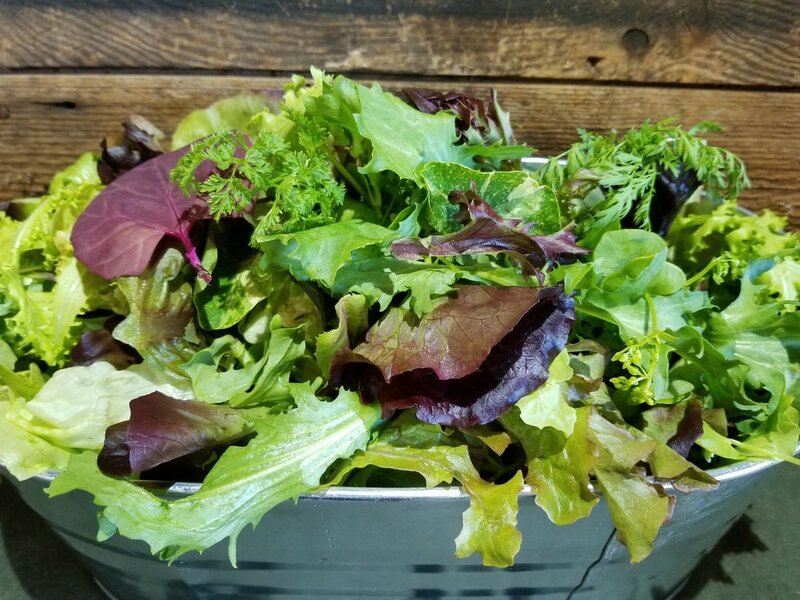 Our Wild Salad Mix evolves with the seasons. We grow 50-70 varieties throughout the year concentrating on those that do best in any given season. This is one of our secrets for extending the season as well. We grow certain greens as our "base", adding as many unusual greens to this as possible. Our salad is a cornucopia of flavors, colors and textures, a feast for the mouth as well as the eye! Mizuna Gardens is a biointensive market garden near Portland, Oregon, specializing in unusual and heirloom salad greens for local chefs. Since the beginning, we are proud to have worked with many creative chefs from the dawning of Portland's now famous culinary scene. Our passion has always been growing greens! Our joy is hearing the surprise and delight people express while discovering the many different flavors possible when leaves are grown past the baby stage. 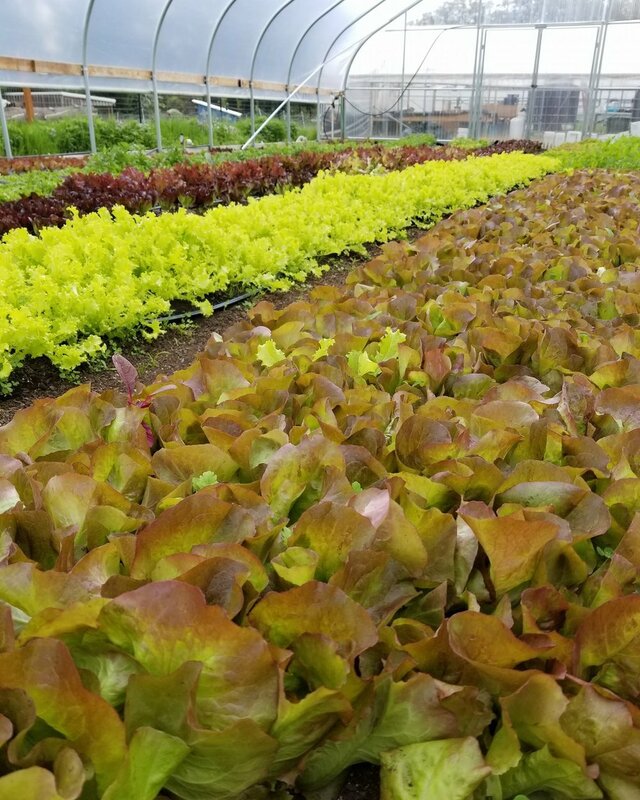 Our six acre farm produces an abundance of premium salad mix each season, upwards of four TONS per season. 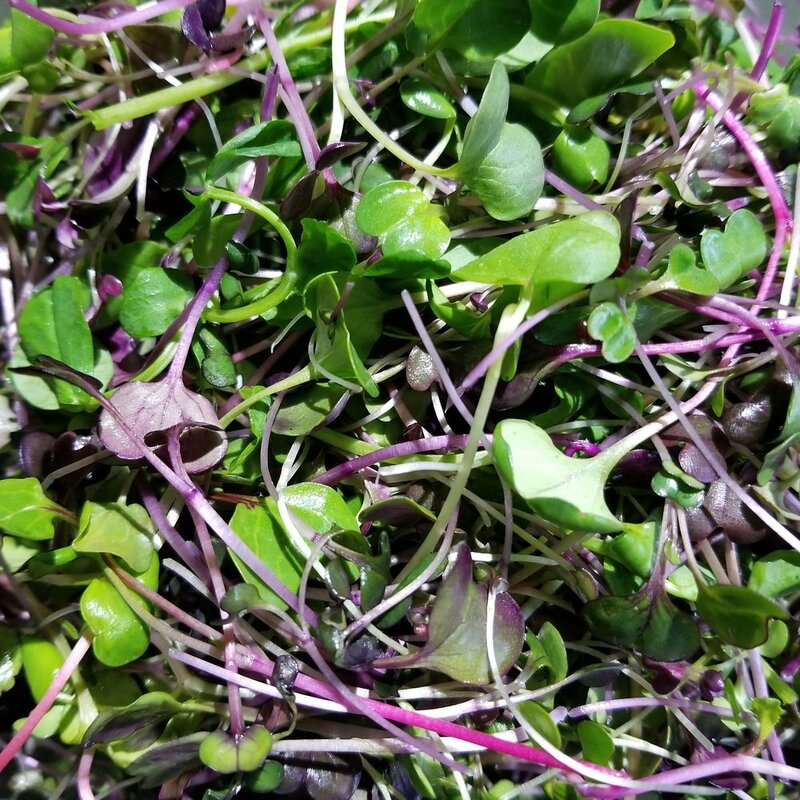 We also grow micro greens, shoots and other leafy produce. We greatly value the relationships formed with chefs and strive to provide the best possible customer service. We are committed to meeting the needs of our wonderful supportive customers. All our work is done by hand without the use of any chemicals whatsoever and hardly a motor in sight. We follow all organic growing principles to a tee and beyond. We buy the best seed and use the highest quality organic soil amendments. We work the land with environmentally-friendly hand tools. Whether planting seeds, transplanting seedlings, weeding beds, or harvesting each leaf by hand, most of the work needs to be done on hands & knees to be done well. 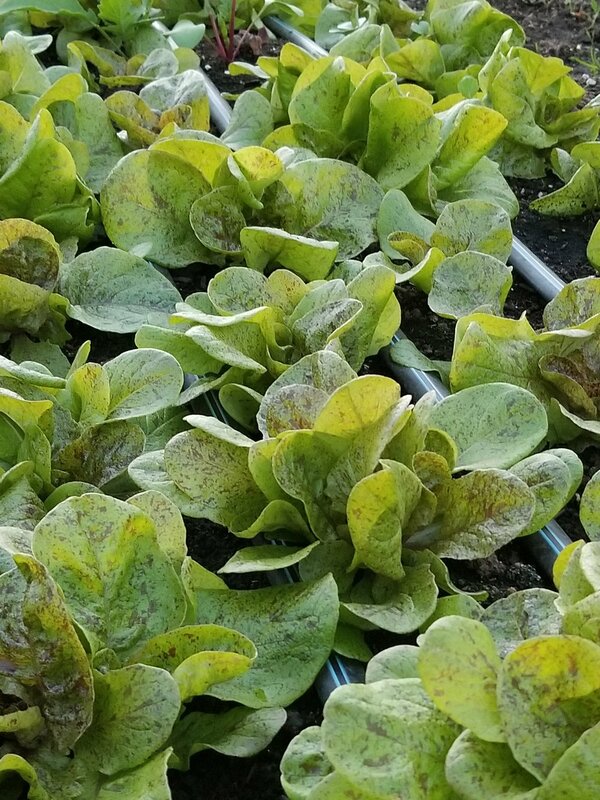 We're devoted to keeping the soil healthy, because healthy soil equals health salad greens. We're extremely honored and proud to supply the following fine restaurants and cafés. We can't thank them enough for their support. Danielle holds a bachelor's degree in psychology, a master's certificate in Addiction Counseling, and has worked in the Scappoose School District for the last ten years. Working with young adults, she has seen the impact food has on everyday behaviors and with her educational background decided that her role needed to start in the ground growing the best possible produce. 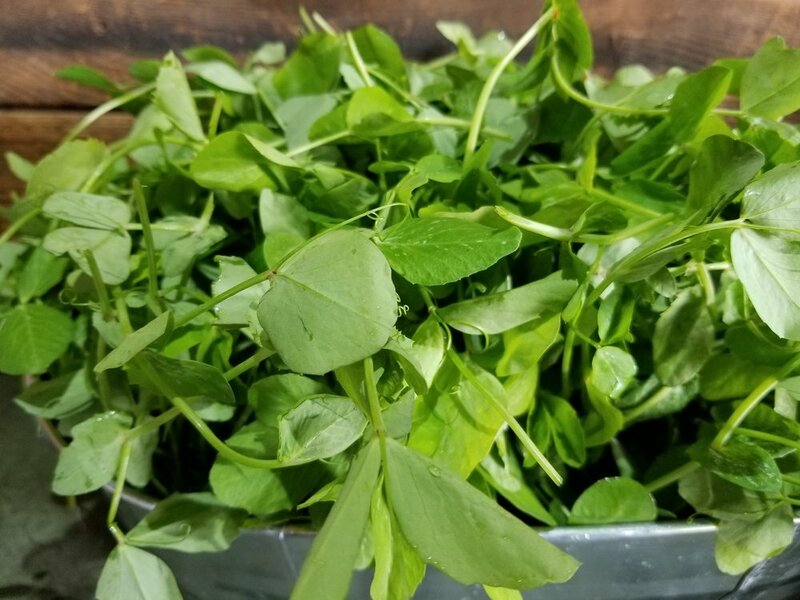 If you are interested in getting our Salad Greens or Microgreens for your restaurant, please let us know by filling out the form. We deliver every Tuesday and Friday morning during our growing season. I got the House Salad from Apizza Scholls last night and just about died. At first, I was kinda turned off by the lack of chopped greens. But, as soon as I let my fork do the walking, I was in H-E-A-V-E-N, HEAVEN. I don't even know half the greens that were included. I know there was radicchio, arugula, and maybe some watercress, but I have no idea what the nutty/lemony sprig was that looked more like a garnish. It was so dern good. Thank you for providing the PNW with good food.